How these Cameras came to be! Goro Yoshida (1900-1993) was born in Hiroshima and in his early years apprenticed in Tokyo with a company that repaired and remodeled motion picture cameras. 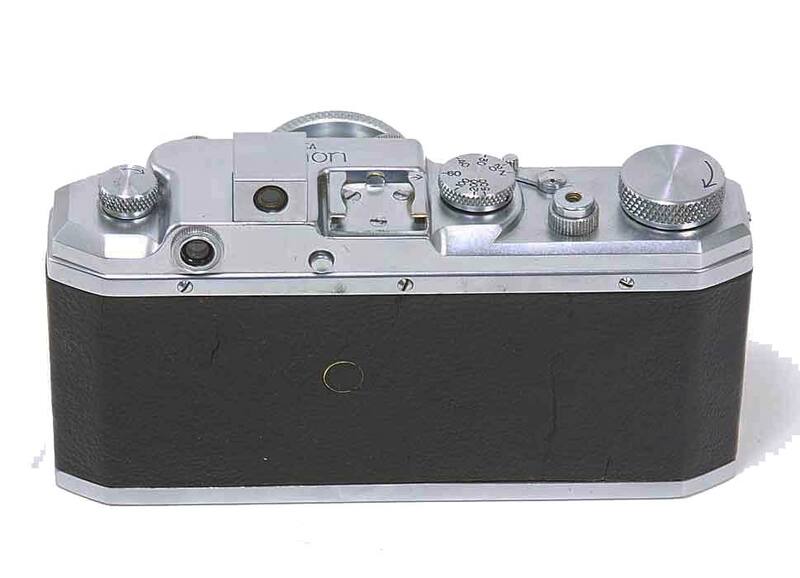 He liked to tinker with machinery and he disassembled and examined the inner workings of a Leica Model II. In later years he said “I just disassembled the camera without any specific plan, but simply to take a look at each part. I found there were no special items, like diamonds, inside the camera. The parts were made from brass, aluminum, iron and rubber. I was surprised that when these inexpensive materials were put together into a camera, it demanded an exorbitant price. This made me angry”. With his brother-in-law, Saburo Uchida and Takeo Maeda , a former subordinate of Uchida, Yoshida established the Precision Optical Instruments Laboratory to develop a 35mm rangefinder camera in November 1933. The laboratory was located in a room of the elegant Takekawaya Building, located in Tokyo. The first prototype camera they called the Kwanon, after Kannon, the Buddhist goddess of mercy as Yoshida was a Buddhist and a believer in Kannon. 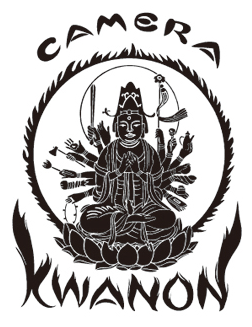 The camera’s log depicted a thousand-arm Kwannon Goddess. The first lens was called the “Kasyapa” which derived from Mahakasyapa, a disciple of the Buddha. 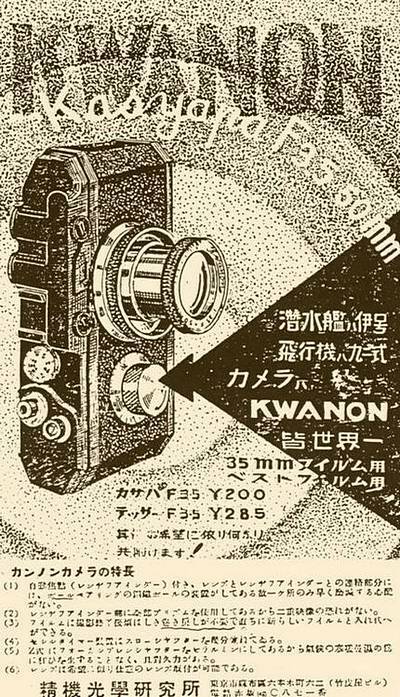 A total of three Kwanon camera variations appeared in ads but the cameras were either drawings or wooden models. Yoshida always said he had completed 10 Kwanon cameras but no one ever actually saw them. They were never marketed. Yoshida left the Laboratory in the fall of 1934 because he felt the path being followed by the Laboratory did not fit with his vision. The first production camera was the “Hansa” Canon (Standard Model), a 35mm focal plane shutter camera, introduced in February of 1936. Canon initially had no facilities for making optical glass and arranged for lenses and rangefinder optics from Nippon Kogaku Kogyo, the company that eventually became Nikon. At the time Nippon Kogaku was a military supplier of optics and, by a stroke of good fortune, was looking into civilian opportunities for their optical production. 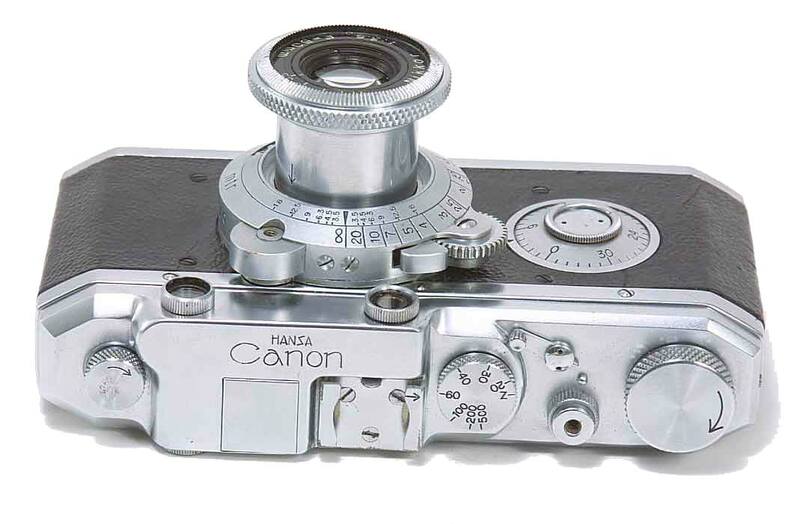 An agreement was reached that they would co-operate in the production of the Hansan canon with a Nikkor f/3.5 50mm lens. The first Canon under this arrangement came to market in February of 1936. 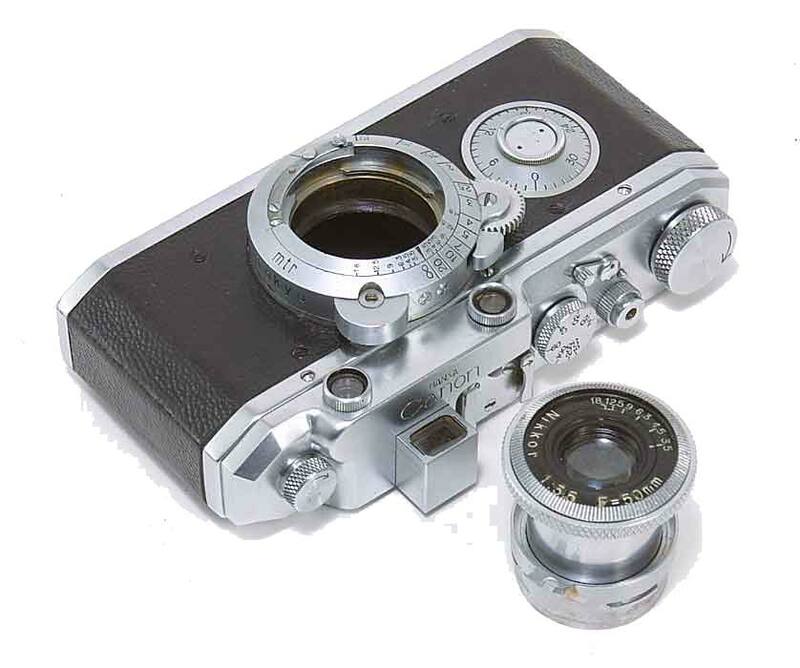 Nippon Kogaku was responsible for the lens, the rangefinder optics, and the optical mountings. 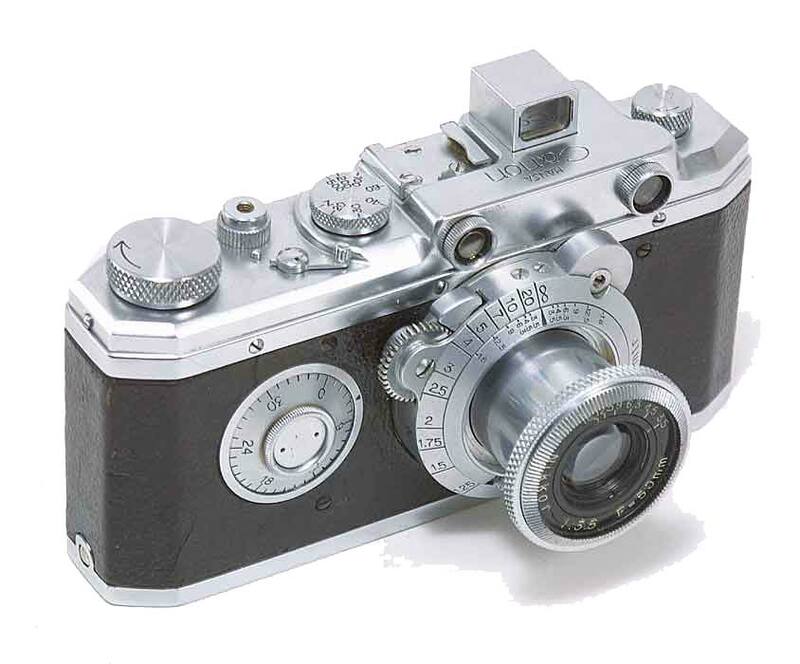 Precision Optical Instruments Laboratory was responsible for the body of the camera including the focal plane shutter and the overall assembly. Soon thereafter the name was changed to Canon. On the 10th of August 1937 Precision Optical Industry, Co. Ltd. was founded as a joint stock company and to this day Canon designates this date as their founding. In April 1939 Canon brought out a less expensive Camera aimed at the common consumer called the Model “J” for Junior. It had a distance scale instead of a rangefinder and a threaded lens mount instead of the three lug bayonet mount used on the Hansa and Canon “S”. It came with a Nikkor 5cm f/4.5 lens. Beginning in 1937 there was a push for the development of the company’s own lens and there was a contest within the company for a new name for these lenses. “Serenar” was chosen meaning “serene” and indicating “clear, calm and tranquil”. Apparently the name was taken from the Sea of Tranquility” on the moon. The lenses on Canon rangefinder cameras of the late 1940’s and 50’s were Leica compatible 39mm screw mounts. Initially they were chrome “Serenar” lenses but were later replaced by chrome “Canon” lenses. All but the very early pre-war lenses were coated. Precision Optical Industry Co., Ltd. escaped major destruction during the war and had continued with small scale productin of cameras. But after the war all was confusion and materials were scarce or non-existent. As a result it was intended to close the company. 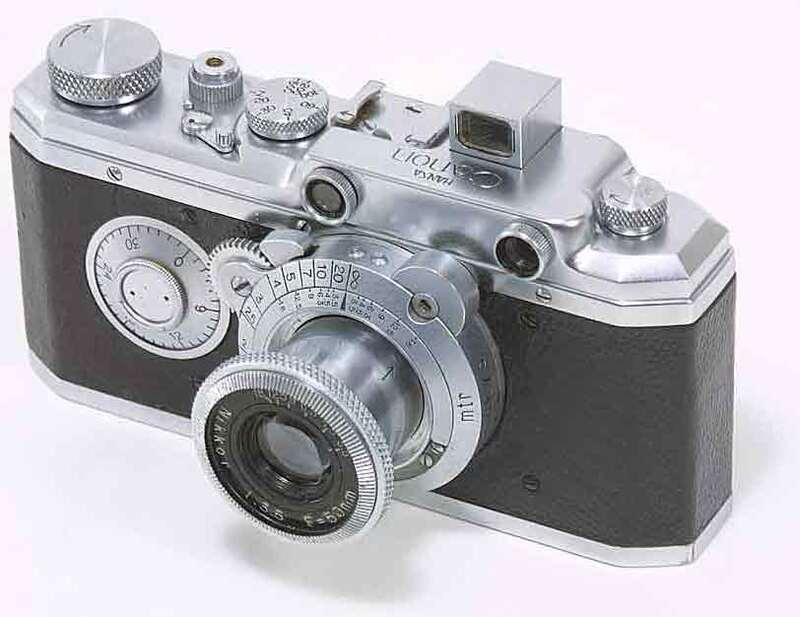 However, after a short hiatus, occupation troops began showing an interest in Japanese cameras and the management realised that there was a demand for Canon cameras. The applied to the Allied Occupation Forces General Headquarters for permission to produce consumer goods and the application was approved on 1 October 1945. 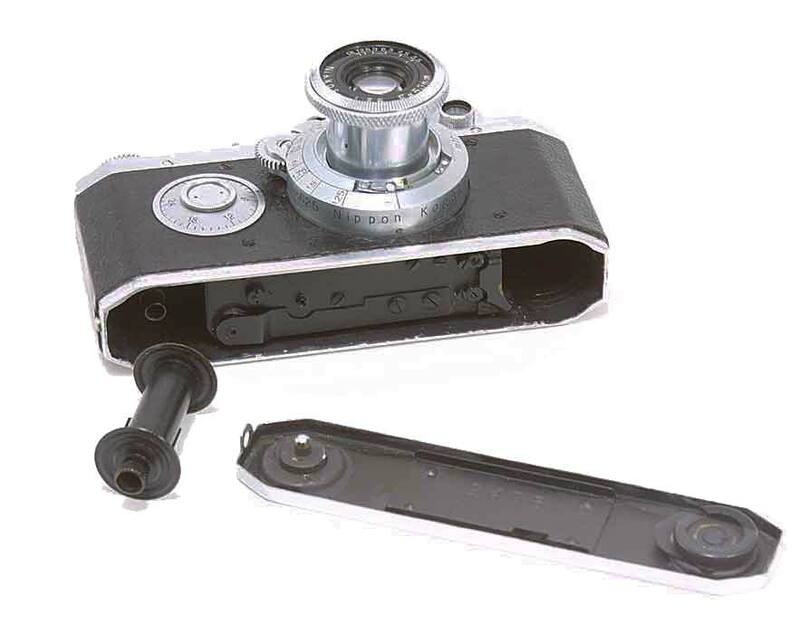 In 1945 Canon introduced the J II (Post War Popular Model) focal plane shutter camera by scrounging parts from previous models and using what scrap materials were available. But it was difficult and records indicate that only three cameras were produced that year. By November of 1946 about 560 J II’s had been produced. There was a steady increase in market demand and the company was swept along. In October of that year the “S II” was introduced. 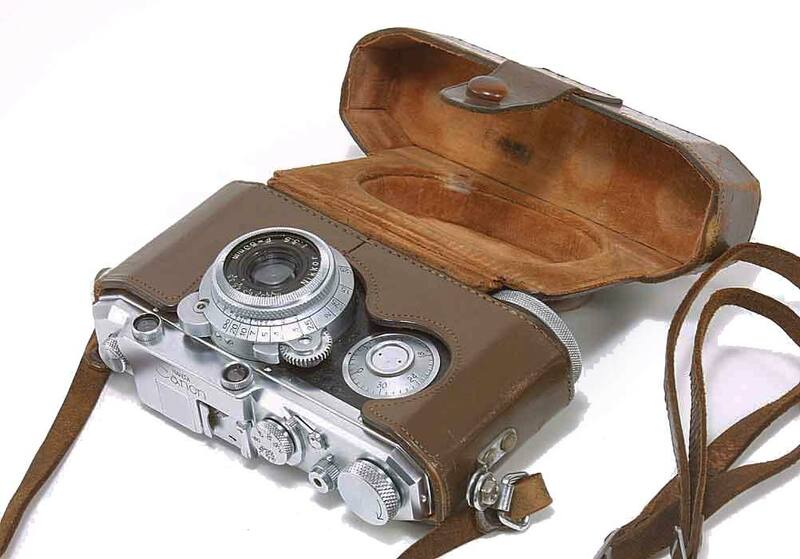 It had a rangefinder combined in a single window with the view finder which even the Leica did not have. 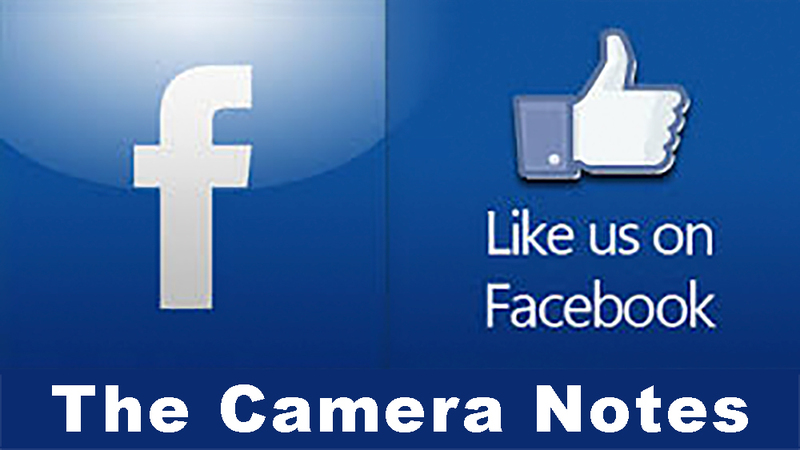 It was in 1947 that the name of the company was changed to the Canon Camera Company, Ltd. The Japanese government, in the same year, designated Canon cameras as a priority export when Japan resumed export activity after the war. The “II B” was released in April of 1949. This time Canon created a 3 mode optical viewfinder in which the magnification could be changed depending on the lens being used. This was a Canon innovation. In 1949 Canon shares are listed on the Tokyo Stock Exchange and the Canon IIB won first prize at a national camera exhibition held in San Francisco. Note: I am indebted to the Canon Camera Museum for much of the material here and there is a wealth of information and detail there that I highly recommend if you seek more knowledge about this history.